There are few things that beat the chic charm of a perfect blowout. And while getting your hair done at the salon gives you long-lasting silky smooth results, it also drills a hole in your pocket. 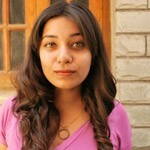 For the same reason, a lot of women opt for at-home blowouts with their trusty styling tools. However, getting your hair to look perfect is never easy, more so when you do not have the basics right. The brush you are using can either make or break your blow out. A good brush, which is meant for styling, will help tone down frizz and will rule out the need for a lot of heat. It is an investment that pays off in the form of amazing hair. 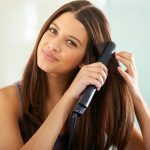 Following, I’ve put together, a list of the 16 best hair straightening brushes available in India. 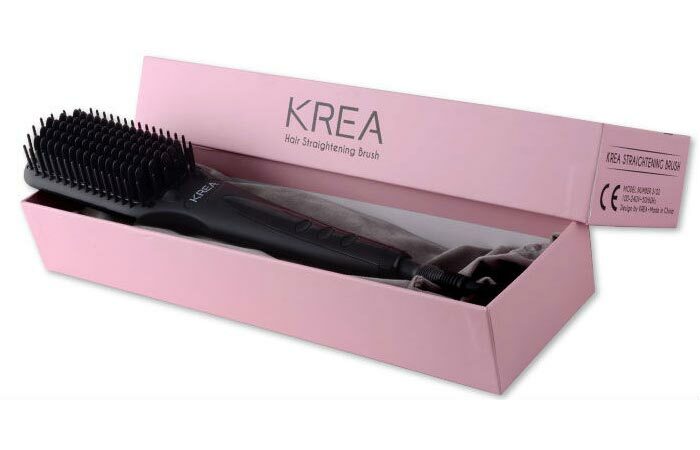 Unlike your regular straightening brushes, the KREA Hair Straightening Brush straightens your hair while brushing it. This cuts down on the number of tools you need and the amount of time it takes to straighten your hair (it straightens your hair within 4 minutes!). The brush straightens large chunks of hair with just a couple of strokes and keeps it that way until your next wash. The brush comes with adjustable heat settings that go up to 180 degrees celsius. It’s made up of tungsten metal and molybdenum-manganese which help maintain an even hot temperature while the outer tourmaline ceramic coating helps seal your cuticle, adding shine while straightening. Hair holds shape for longer. Comes with a 1-year replacement warranty and a 30-day money back guarantee. 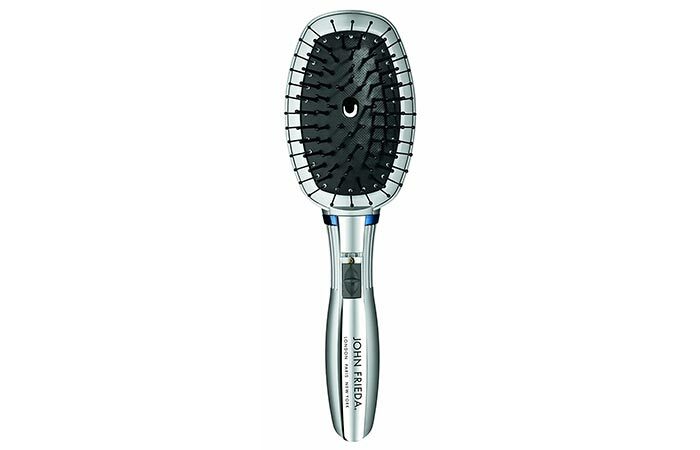 John Frieda’s paddle brush claims to reduce frizz and add shine because of a special ingredient – silicone. The brush is made of ion infused tourmaline, which releases negative ions that help tighten your cuticle layer and lock the natural oils in. It works well for hair that is prone to tangles and breakage. When used for straightening, the result is a smooth and flat finish. 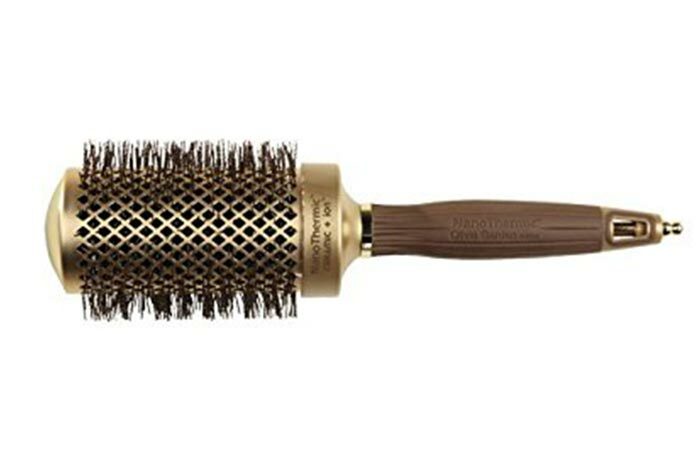 While this brush is not much of a styler in terms of its bristles, it is excellent for frizz control. Combination of hard and soft bristles. Can be used for wet and dry hair. Cuts your hair drying time in half. Runs through batteries in no time. 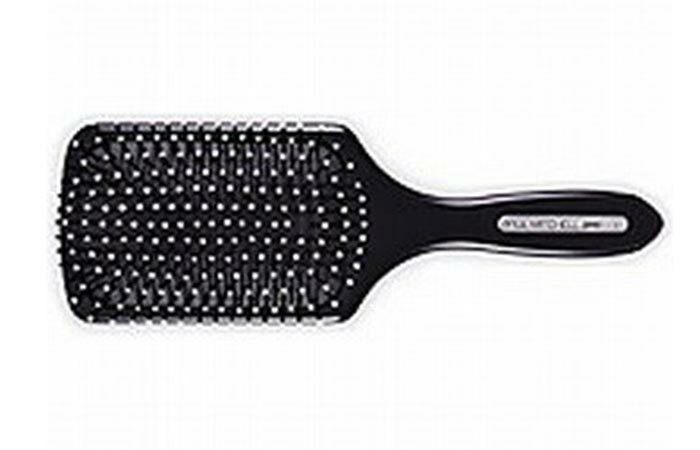 Paul Mitchell paddle brush boasts of quality. The nylon pins, which are ball-ended, massage the scalp through the hair. This works best for hair that has loose to medium curls. The paddle brush is sturdy and there is an air cushion under the bristle. When you brush your hair, the air is let out to let the bristles perfectly conform to your head’s shape. Works for fine and thick hair. Perfect for a scalp massage. The KS05, a full-sized paddle brush, is an excellent tool for styling. 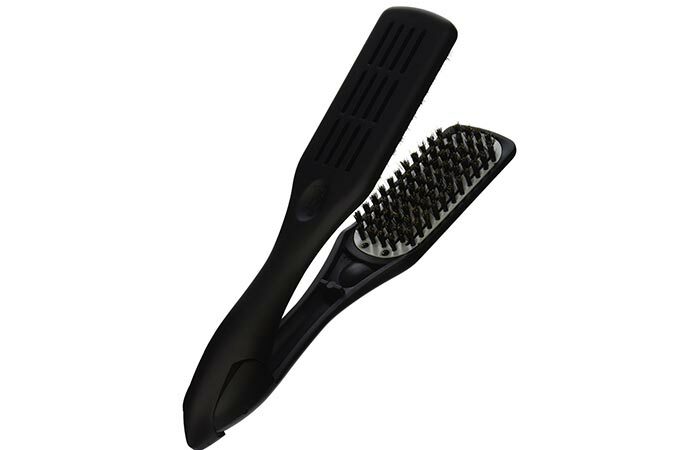 The carbon body and the nylon bristles help in smoothing your hair as you straighten it. It helps detangle and is lightweight, making it easy to carry around. The Olivia Garden NanoThermic Ceramic Ion Brush, even with a metal barrel, is extremely lightweight and really easy to handle. The barrel heats up fast and retains heat longer, so straightening your hair becomes easier. The vents are extra-large, and therefore allow more air from your dryer to flow through. 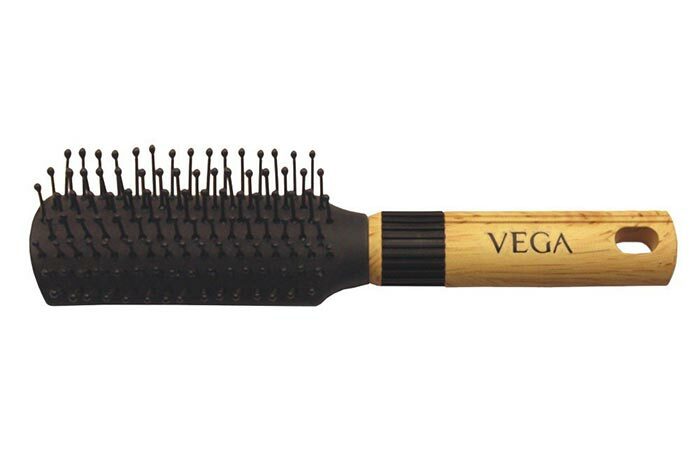 The wavy bristles are heat-resistant and soft on your hair and scalp. This brush reduces frizz and flyaways and leaves you with silky-smooth, straight hair. Retains the heat, allowing for better styling. The brush heats up fast and can cause burns. The Remington Silk Round Brush has been designed to give you salon-straight hair right at your home. 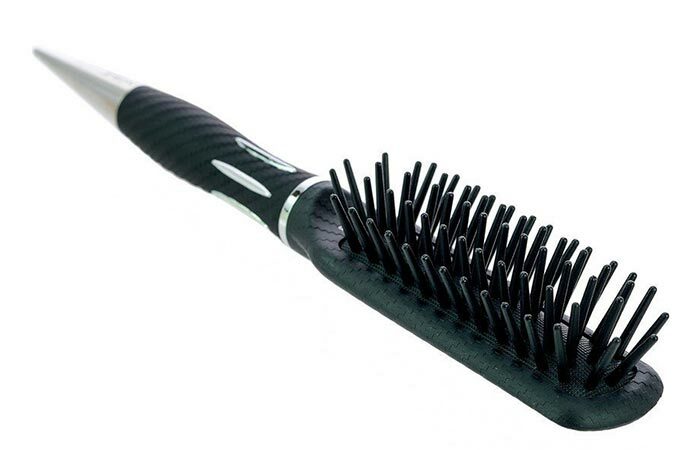 The bristles are a combination of boar and nylon, which help in reducing frizz and smoothen out your hair. It also comes with a sectioning pin to hold your hair in place as you straighten it. Helps achieve a sleek and shiny blowout. Bristles have a great grip on hair. Does not grip the smaller strands of hair. 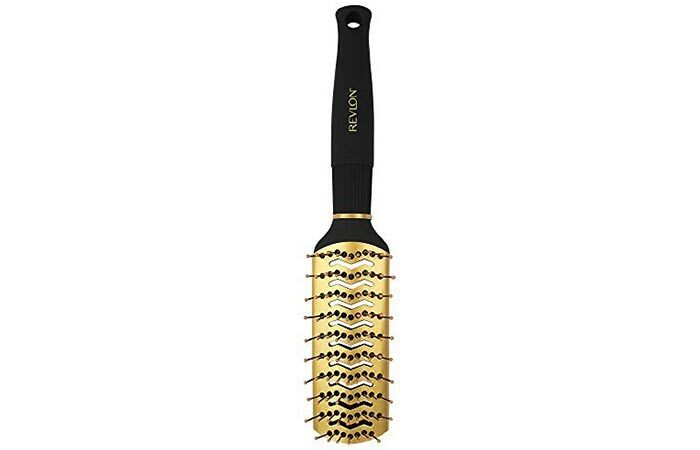 The Revlon Perfect Style Vent Brush is a great brush to straighten your hair with a blow-dryer. The vents allow the heat from the dryer to hit your hair directly, and the ceramic tunnel helps distribute heat evenly. 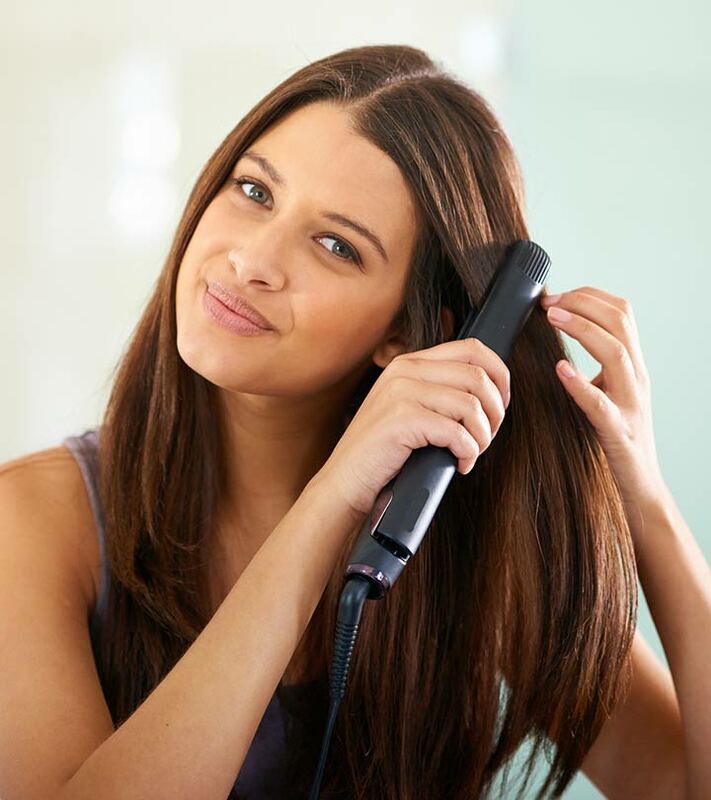 The rubberized handle offers a good grip, so there is no slippage as you straighten your hair. Cuts hair drying time in half. Helps you achieve a shiny blowout without frizz. Bristles glide easily through hair. High heat can bend the bristles out of shape. For the women who cannot live without a flat iron, this is a great alternative as it keeps heat damage in check. The brush has ceramic plates and boar bristles, thus making straightening easy and convenient. The boar bristles glide through your hair. Makes your hair look naturally straight when used with a blow dryer. Bristles are too soft for people with coarse hair. The Global Keratin Vent Hair Brush was developed as a part of the Global Keratin Straightening system. The barrel has a curved shape, with vents to allow more air to flow through. Since the heat from the blow dryer hits the hair shaft directly, there is a significant cut down on straightening time. The brush is gentle on hair and has a solid grip, making it great for straightening hair. The curved shape of the brush is perfect for a scalp massage. Glides through wet hair well. Allows for a great frizz-free blowout. Not very sturdy and wears out faster than most brushes. 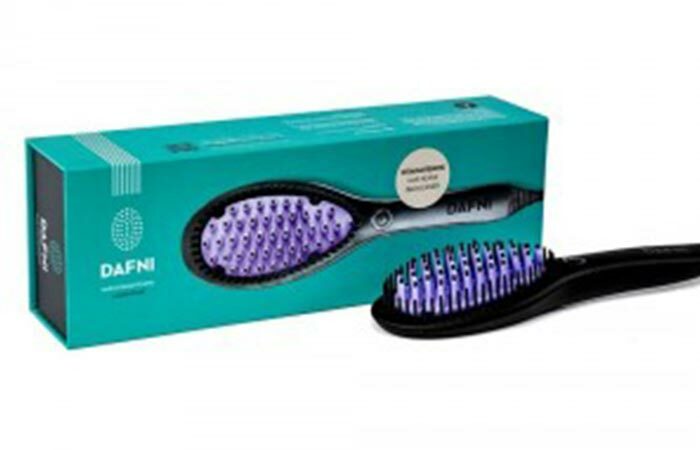 The Dafni Hair Straightening Brush is shaped like a paddle brush but doubles as a hair straightener. It does not need clips like the usual hair straighteners and flat irons. To use it, all you need to do is plug it in and run it through your untangled hair like you would with a regular brush. 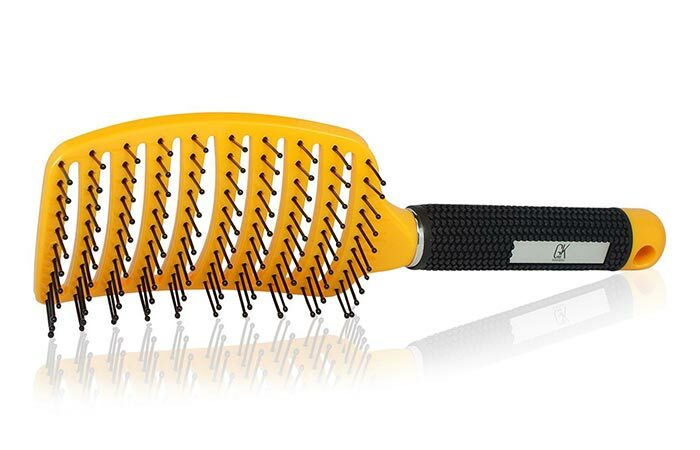 It has ceramic bristles that heat up to the ideal temperature for straightening, which is 185 degrees Celsius. Within seconds of being plugged, it heats up and is ready to be used. It makes the hair smooth and shiny and does not take as much time as the traditional straightener does. Does not need to be used with a blow dryer. Makes your hair look naturally straight. Ceramic bristles allow the brush to heat up evenly. Does not have adjustable heat settings. Does not give thick hair a sleek look. 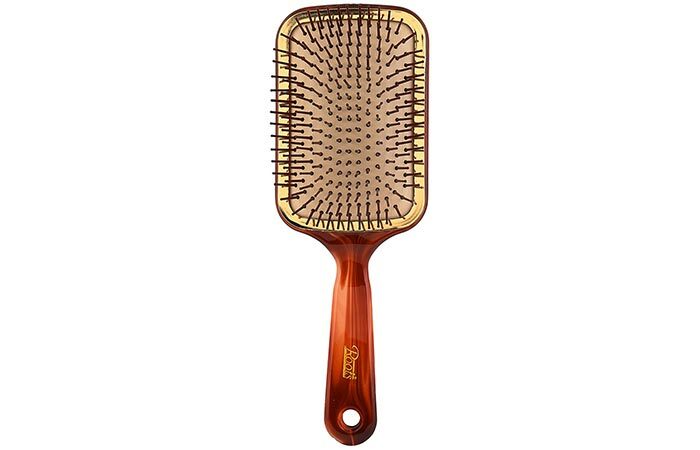 Roots’ Golden Rim Shell Finish Paddle Brush has cushioned bristles that gently massage your scalp. It has an attractive look with its tortoise shell design. This brush helps you achieve a bouncy blowout and has an air vent for even heating. Feels good on the scalp. Gives fine hair a voluminous blowout. Bristles wear out quite fast. Does not have a slip-free grip. This mini brush is perfectly sized for your hand bag. It is extremely travel-friendly and can be used to style short and medium length hair. The handle of the brush gives you a firm grip and the bristles feel great on your scalp. Dive Express Vent Brush is a great tool for detangling and styling. It helps cut down your everyday blow-drying time and has an air vent that allows for even heat circulation, reducing the risk of heat damage. Grips hair well while blow-drying. Allow for a soft and smooth blowout. Does not last as long as other brushes. The bristles tend to wear out because of heat. 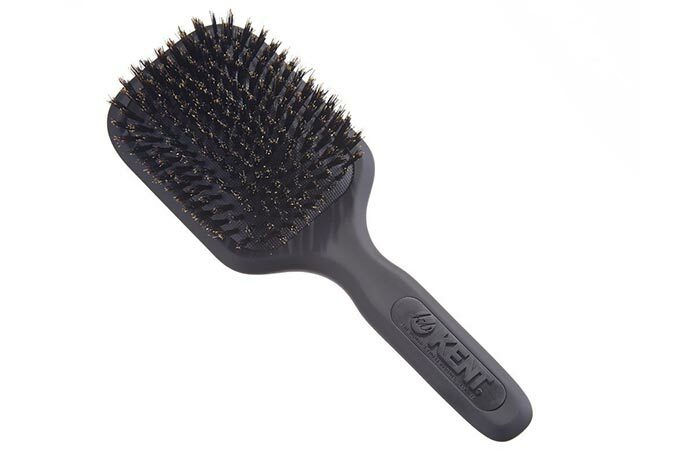 Kent’s Airhedz Smoothing And Finishing Brush is suited for both, home and salon use. 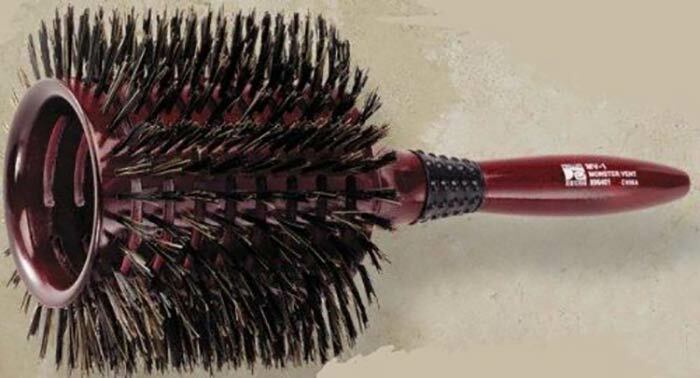 The boar bristles on this brush grip the hair well and allow for a smooth blowout with a shiny finish. It helps smoothen the hair cuticles, adding shine. The bristles grip and glide through hair well. Gives a smooth and shiny finish. Does not feel good on the scalp. 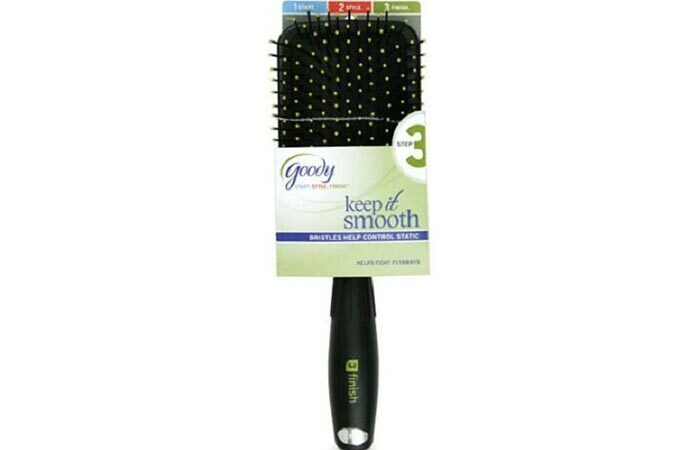 GOODY’s Finish Paddle Brush is great for all hair types and helps give your hair a smooth and static resistant finish. 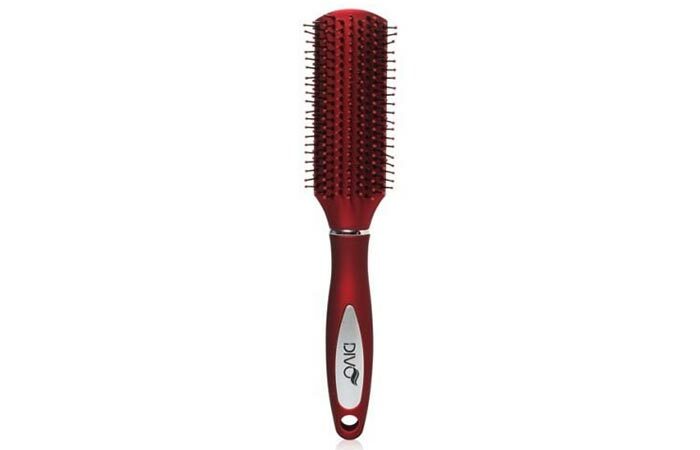 The brush has a good slip-free grip and bristles that feel good on the scalp. It detangles well and helps you achieve a shiny blowout with bounce. Feels great on the scalp. Works well for long and thick hair. Handle starts to loosen after a few months. Phillips’ Brush Monster Vent 1 has a 5-inch diameter which helps you achieve a smooth and bouncy blowout. 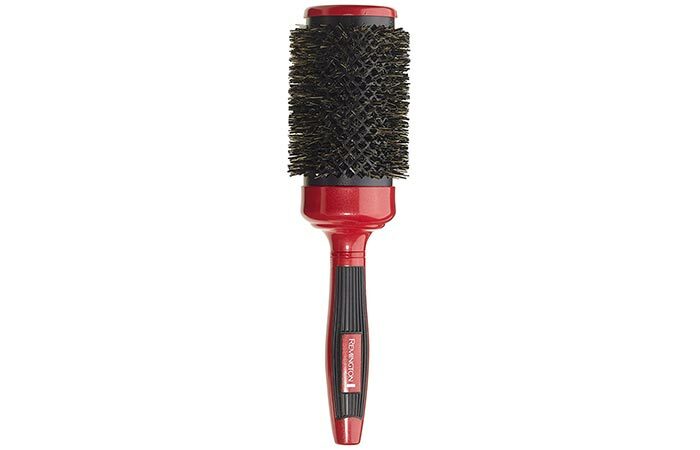 The round brush has reinforced bristles which are fully vented to help optimize your styling sessions. The handle is topped with a rubber grip for a slip-free experience. Helps you achieve a smooth and bouncy blowout. Cuts blow-drying time in half. A bit on the heavier side. Great hair is just a hair brush away (literally.) With this list of hair brushes, it would be hard to ever have a bad hair day again. Do you use any of the products mentioned in this list? Tell us about your experience in the comments section below. Want to get salon-style hair at home without any hassle? You don’t need to spend huge amounts of money at a salon to get those perfect curls. All you need is a budget-friendly hair styling tool – a round hair brush!